Finding the perfect vehicle that meets both your needs and expectations can be quite the challenge. Drivers in the market for their next luxury sedan have a huge decision to make because there are tons of options available to choose from. Our team here at Certified Autoplex specializes in luxury vehicles, so we’re an excellent go-to for all your automotive questions. Since we carry such a wide variety of inventory, our team has been working to narrow down our options and highlight particular models to make it easier for shoppers to do their research. This time we’re going to shine a light on the used BMW 7 Series models we have available here in Carrollton. It’s known as one of the most innovative vehicles in its class, and the experience it offers won’t soon be forgotten. This luxury sedan is filled to the brim with all top-of-the-line features as superior performance capabilities. Let’s dig deeper to see what this vehicle offers. If sophisticated and classy are two words you’d use to describe your dream car, then the BMW 7 Series is sure to impress. This luxury sedan truly has everything you could imagine, and when you purchase a used model it is much more affordable than buying new. There are five 7 Series models available on our lot right now, but it is important to note that our inventory is constantly changing. The models range from 2006 to 2014, and the majority of them come with a lifetime powertrain warranty for added peace of mind. The BMW 7 Series is known for providing a powerful, impressive driving experience. It can go zero to 60 mph in less than five seconds, and it can pump out more than 400 horsepower. There are a few different size engines depending on the model chosen, but all of them are set standard with an automatic transmission. 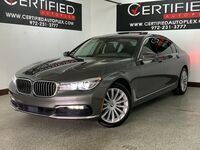 Rear-wheel drive is also standard for all of the used BMW 7 Series models on our lot. Some of the popular features include a driver assist package as well as leather heated and cooled seats, a heads-up display, navigation system and a sunroof. Those interested in learning more are welcome to contact our team here at Certified Autoplex for more information. Drivers can get behind the wheel by scheduling a test drive online for the specific model they’re interested in. Interested in a Used BMW 7 Series?